There are three things you should consider before you launch a new product marketing campaign. Watch the video. 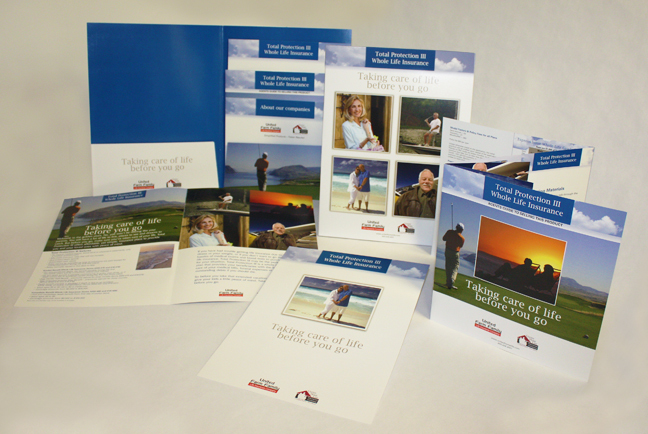 Top image: The UHL Sales Packet included a folder that held a Customer Sales Brochure, an Agents Guide to Selling, and an Information Sheet that gave pertinent information about the company. 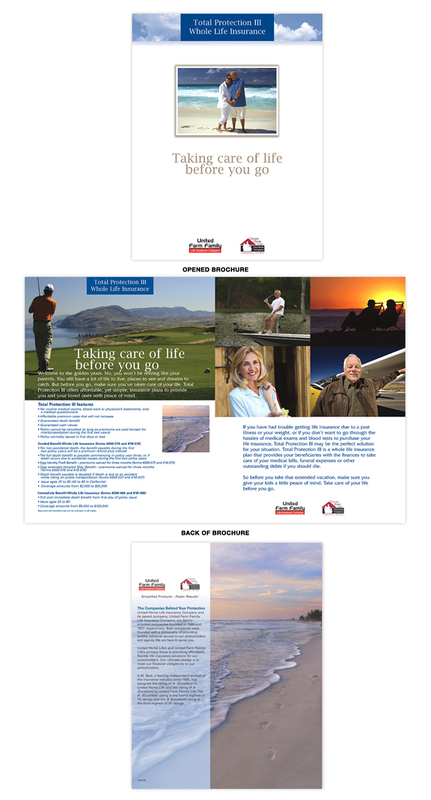 Project: The client was launching a life insurance product targeted to persons who had health issues or did not qualify for traditional insurance. Before you launch a new product, it is very important that you first define the market you are trying to reach. It is difficult to hit a target if you do not know where you are shooting. We did a demographic study of the target market and a competitive analysis for UHL. This insurance product was targeted to senior citizens who did not qualify for traditional life insurance, primarily due to health issues. The competition had used a scare tactic to sell their products. Their message went something like this: "you are old and sickly. Buy our product to cover all your medical bills before you die!" We decided to take another approach. We stressed that living out your senior years were great, but to buy this product so you could enjoy life and not worry about passing a medical bill onto your family if something were to happen. This brings me to my second point: never copy the competition with your marketing message or the creative elements of a design. Be unique. Stand out from your competition. If you sound different and look different you will be noticed. We also took into account their sales and distribution system. This is the third point about launching a product. You must understand the way it is sold. 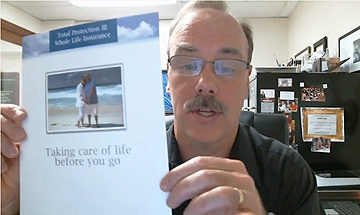 UHL works through independent insurance agents who sell this product face-to-face. This is key to the demographic we are targeting. Seniors are not likely to shop for this product online. It was important that we market this in print. It was really important that we gave the agent the tools he needed to make a sale. 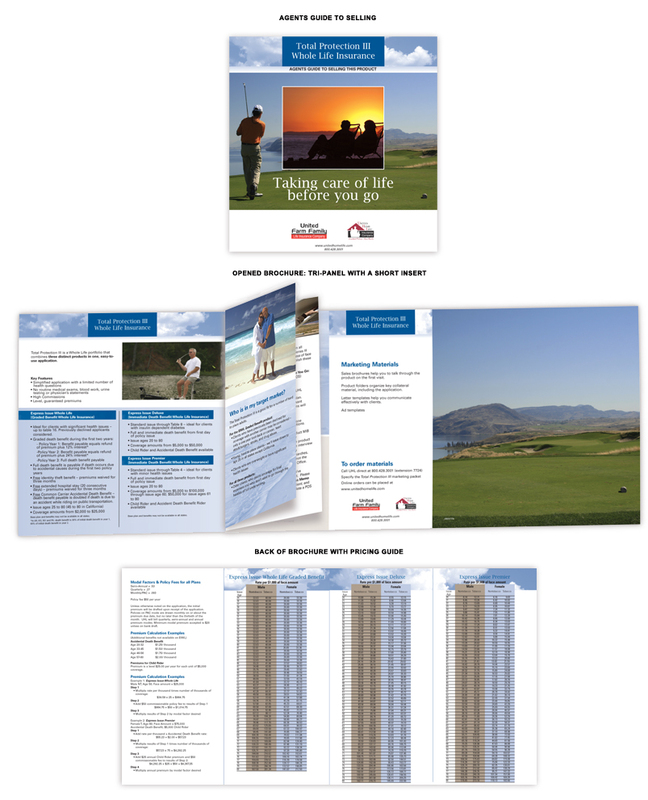 We produced a sales packet for these agents which included a folder, a client brochure, an information sheet on the strength of the company and an agent’s guide to selling the product. This proved to be a key element. It gave directions on finding the target market, a rate chart with a calculator, and a way to get underwriting approval at the point of sale. This was highly successful. The client met their annual sales goals in two months.